The Federal Reserve’s quasi-government takeover of insurance giant American International Group (AIG) this week has increased the criticism of the Fed and particularly Ben Bernanke, according to an article in yesterday’s Wall Street Journal. And it’s already come to pass that “the Fed’s purpose and scope has been radically revamped” through the central bank’s lending to investment banks, accepting less than stellar collateral, keeping the helicopters dumping liquidity 24/7 that banks grab and hoard, and invoking Section 13.3 of the Federal Reserve Act for the second time in six months ($29 billion for JP Morgan to acquire Bear Stearns; $85 billon loan to AIG). Check out the link to the Fed since “any individual, partnership, or corporation who has been unable to secure adequate credit accommodations from other banking institutions” might be able to get a loan from the Fed under Section 13.3! Treasury Secretary Paulson certainly fits the bill in my description of “high level (government) people will exert greater pressure on him to do their bidding.” Paulson’s not only usurped the President but also the presidential candidates! There’s nothing in Section 13.3 about the Fed taking 79.9% equity in a corporation it grants a loan to under “unusual and exigent circumstances.” No, that’s Mr. Moral Hazard before he got reminded that he’s a member of the Order of the Goldman Dawn. The Harvest Moon gave Bernanke and the Fed a taste of what is to come as the energies of the Full Moon and radical change agent Uranus challenged his natal setup of the Sun in Sagittarius, Pisces Moon, and Jupiter in Gemini. Jupiter rules Sagittarius bestowing Bernanke with an expansive and optimistic outlook. But as I pointed out in the Weekly Forecast “with Saturn challenging the Fed’s Mercury and Saturn, the FOMC is likely to present a more pessimistic outlook.” Now that Paulson wants Congress to agree to a plan to buy hundreds of billions of bad assets from Wall Street, Bernanke’s upbeat demeanor has suddenly vanished. In a meeting Paulson and Bernanke held Thursday night with Congressional leaders, the Journal reported Bernanke’s description of current financial conditions as “chilling.” Physically, Saturn energy represents cold and harsh climatic conditions. Mercury is communications and mental outlook. Put the two together and the professor probably wishes he was back at Princeton continuing his quest to find the holy grail of macroeconomics. The Fed had $800 billion in 2007. Last week it was $480 billion. All these working weekends haven’t allowed the Fed enough time to study and strengthen its balance sheet; what we’re all supposed to be doing while Saturn’s in Virgo until July 2010. I guess Bernanke hasn’t asked Paulson why the Treasury’s been holding extra auctions to replenish the Federal Reserve Bank of New York. Congressman Frank told the Journal that “No one in a democracy, unelected, should have $800 billion to spend as he sees fit. That’s not the way to run a democracy.” With all due respect Congressman, the U.S. is not a democracy; it’s a Republic – a banana republic. Related Post: “Virgo New Moon Cycle”. 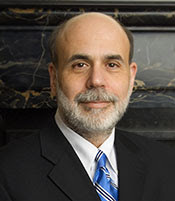 Federal Reserve section has several posts on Bernanke and the Fed.